My unit has an “-N” or “-N6” at the end of it, what does that mean? -N means that the unit is R290, and -N6 means the unit is R600. The function of the unit is the same, this will mainly affect serviceability. How do I know which Turbo Air unit I will receive? Depending on your location, you may receive a model slightly different from what is shown, and specs may vary. For example, you may see “N” or “N6” at the end of the model number. To confirm which unit you will receive, please contact one of our customer solutions specialists. Does free shipping apply to this Turbo Air item if I am shipping it to a residential address? No. The manufacturer charges an $80 fee for non-straight truck deliveries and a $100 fee for straight truck deliveries to a residential address. Please contact our Customer Solutions team prior to placing your order if you have any questions. 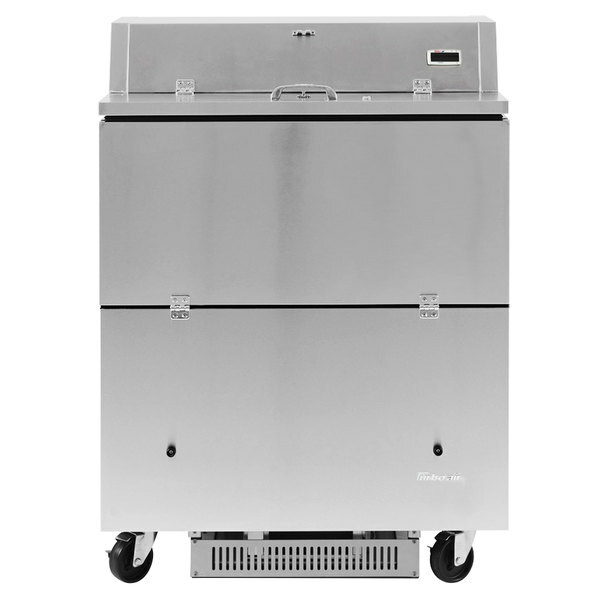 A great choice for any school lunch room, university dining hall, or cafeteria setting, this Turbo Air TMKC-34D-N-SS Super Deluxe 34" dual sided all stainless steel milk cooler offers quick, easy self-serve beverage service. 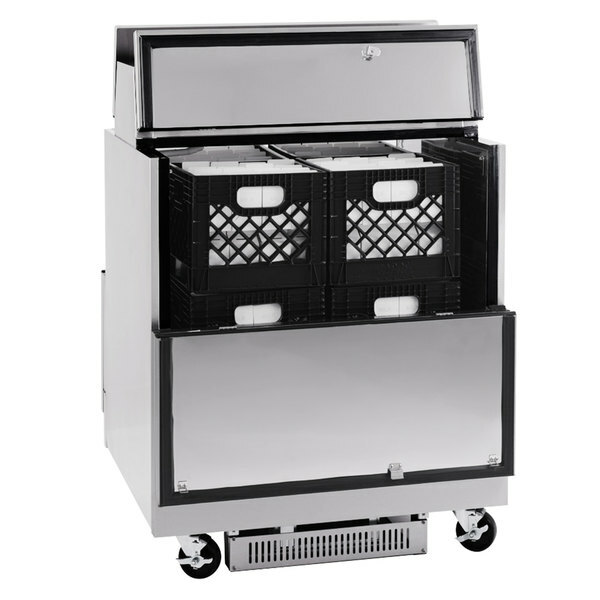 Capable of holding up to (8) 13" x 13" x 11" crates, this milk cooler keeps your cafeteria well stocked for the lunch rush. It also features a durable stainless steel exterior and interior to stand up to daily abuse from students. Plus, an external digital thermometer provides temperature readings at a glance. 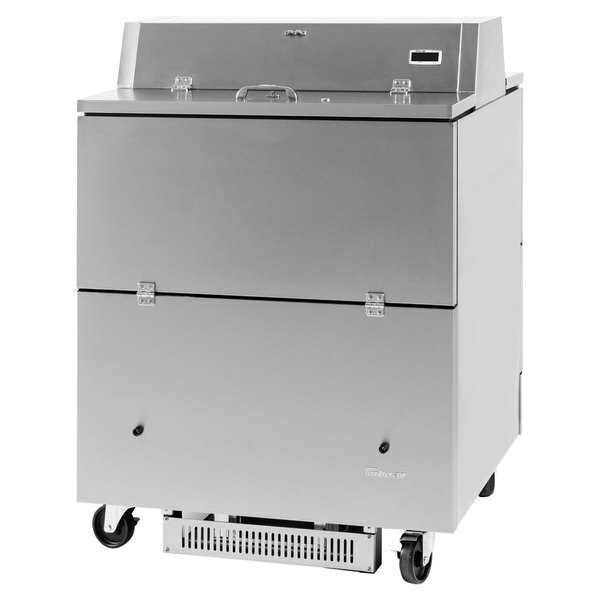 This cooler features a double-sided design for convenient access from both sides. 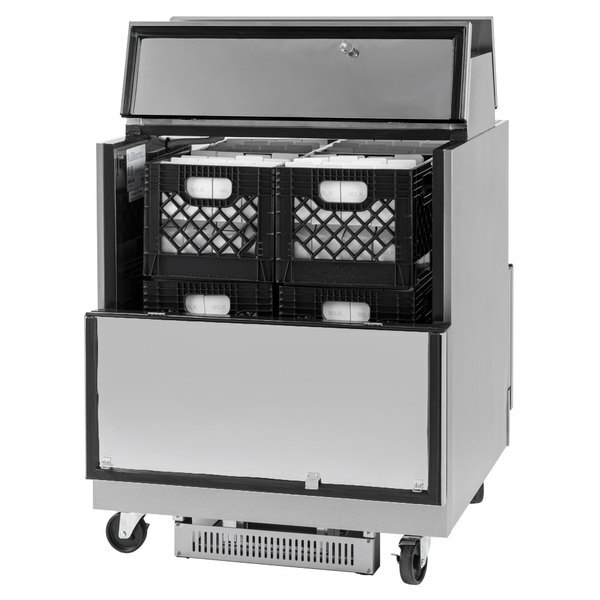 Use it at the end of your food bar or beverage station to keep the lines moving and provide all of your students or customers with a selection of cold milk and other beverages. For enhanced security, this Super Deluxe model has a built-in door lock to prevent unwanted tampering. When it comes time to clean your milk cooler, the process is made simple by the convenient floor drain on the rear right-hand side that comes with a hose adaptor. 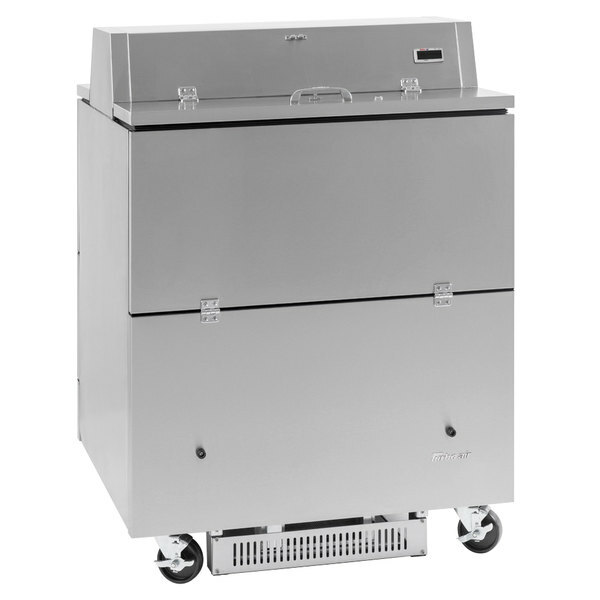 Additionally, the included 4" swivel casters (2 locking) make it easy to maneuver the cooler throughout your facility for routine floor cleanings. A 1/3 hp compressor runs on eco-friendly R290 refrigerant. This specialized refrigerant has an ozone depletion potential (ODP) of 0 and a global warming potential (GWP) of 3, making it an environmentally-responsible choice for your business. High-density polyurethane insulation increases the unit's structural strength and energy efficiency. A 115V electrical connection is required for operation. Warranty does not apply to, and Turbo Air is not responsible for, any warranty claims made on products sold or used outside of the United States and Canada. RESIDENTIAL USERS: The right is reserved to deny shipment for residential usage; if this occurs, you will be notified as soon as possible. For units, the manufacturer charges an $80 fee for non-straight truck deliveries and a $100 fee for straight truck deliveries to a residential address.